because he is gay & Prop 8 remains unconstitutional. to rest this distraction from the real issues in this case. said John Lewis, Marriage Equality USA’s Legal Analyst. issues its opinion later this year. So this case drags on. We attended Judge Ware’s hearing on the motion alongside many LGBT couples who are unable to marry because of Proposition 8. 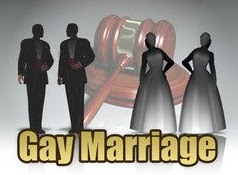 By moving this case forward today, Judge Ware has brought their wedding days one step closer to reality. We now turn our attention to the jurisdictional issues in this case before the California Supreme Court and the Ninth Circuit Federal Court of Appeals. We are very hopeful that these courts will recognize that the Prop. 8 proponents have no basis for being able to continue their appeal -- and that Proposition 8 will become a distant memory as soon as possible. Basic fairness and equality under the law mandate that every person deserves the freedom to marry the one they love.